Updated crossover Acura reached Russia MDC model year 2016-2017. New items can be purchased in the salons of official dealers Acura since October 15, 2015 at a price of 3399 thousand. 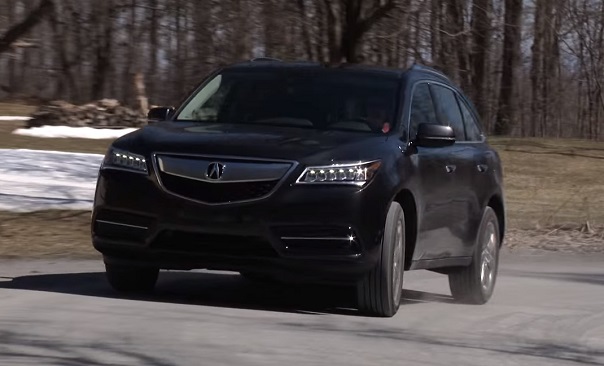 Rubles for the initial basic version of Acura MDX Techno up to 3849 thousand. Rubles for the complete set of rich Acura MDX Advance. It should be noted that it is not necessary to look for global changes in the exterior and interior of the updated Acura MDX 2016-2017, compared sdorestaylingovoy model, they simply do not. New details are hidden under the body crossover — is a modern 9-speed automatic transmission and all-wheel drive SH-AWD a new generation. With Performance premium Acura updated Japanese crossover MDC and begin our review. Under the hood, as before, no alternative petrol 3.5-liter V6 (290 hp 355 Nm), which highlighted the latest automatic transmission 9. The new machine is not improved dynamic performance, as well as 6 automatic transmission mounted on a pre-reform model, the new crossover to accelerate from 0 to 100 kmh in 7.6 seconds, top speed of 220 mph, but the greater the number of stages in the gearbox reduced the fuel consumption. Updated Acura MDX satisfied with just 7.7 liters of gasoline when driving outside the city and is placed in 14.2 liters in city mode, while fuel consumption in combined mode is just 10.1 liters, which is quite not bad for a large vehicle curb weight of more than 2000 kg. Relatively new generation SH-AWD (Super Handling All-Wheel Drive). This all-wheel drive, in our opinion, is the best option available today in the class of crossovers. Succeeding generations new SH-AWD efforts of engineers Honda Motor Co became more compact and 25% lighter than the previous design, as well as specialists have improved the distribution of torque between the axles. • External dimensions of the body, the Acura MDX 2016-2017 up to 4935 mm long, 1960 mm (in view mirrors 2207 mm) in width, 1730 mm in height, with a 2825 mm wheelbase. Ground Clearance — 200mm, approach angle — 16 degrees, the angle of 19.5 degrees. With the default installation of rubber sized 245/55 R19 front track — 1685 mm, rear track — 1700 mm. Inside, the updated crossover changed only the central tunnel between the front seats and safety systems control unit. The new 9-speed automatic transmission with push-button control (see. Photo in the gallery), this unit is perfect fit into the whole in a stylish and modern interior of the Japanese seven-seat crossover. Cargo space Acura MDC can accommodate 234 liters of cargo volume behind the third-row seat backs up to 1344 liters with the seats subject to the addition of the second and third rows folded a third row of the trunk takes 676 liters. For the Russian market Acura MDX 2016-2017 model year equipped with an enlarged 5.8 liter washer fluid reservoir and the battery capacity of 72 A / h.
In Russia, the new MDX crossover from Acura offered dvuhkomplektatsiyah. Basic Techno includes a fully LED headlamps Jewel Eye LED, 19-inch alloy wheels, keyless access to the salon with a button engine start, an electronic parking brake, parking sensors front and rear, rear view camera, electric door mirrors with memory positions and heated mirrors, a sunroof and tailgate with electric drive, leather seats, electric front seat adjustment and steering column, three-band climate control, heated front and rear seats, audio system ELS premium from 11 to five speakers, multimedia system with touch-screen screen . More expensive and rich equipment Advance complement the basic equipment of the crossover round view system, adaptive cruise control, trim Milano genuine leather seats with perforated, ventilated front seats, inserts made of natural wood (ash), manual processing, sun side curtains for rear passengers, an entertainment console in the rear (HDMI, VIDEO, AUX), in the presence of the advanced security system: a system to prevent collisions CMBS, blind zone monitoring system, Lane Departure system and a system for tracking objects in the rear cross traffic when reversing.